This ideal excursion mountain impresses visitors with a breathtaking 360-degree panoramic view – onto Lakes Lucerne, Zug and Lauerz among others. In 1871, Europe’s first mountain railway made it to this striking viewing point. Today, two cog railways – one from Vitznau and one from Arth-Goldau – travel to the Rigi Kulm and its summit hotel. From Weggis, an aerial cableway leads directly to Rigi-Kaltbad. The summit view onto 13 lakes, into the Alps and towards the Black Forrest delights guests from near and far. Arrival: Boat or bus to Vitznau, continuing on the cog railway to Rigi Kulm; train or bus to Art-Goldau, continuing on the cog railway to Rigi Kulm; boat or bus to Weggis, continuing on the areal cableway to Rigi Kaltbad. Travel duration to summit: 33 minutes from Vitznau to Rigi Kulm; 37 minutes from Goldau to Rigi Kulm; 10 minutes from Weggis to Rigi Kulm. Attractions: 360-degree panorama on the summit, special steam train rides, Rigi Kaltbad mineral bath & spa. There are roughly 30 mountain inns on Mt. Rigi. Mt. 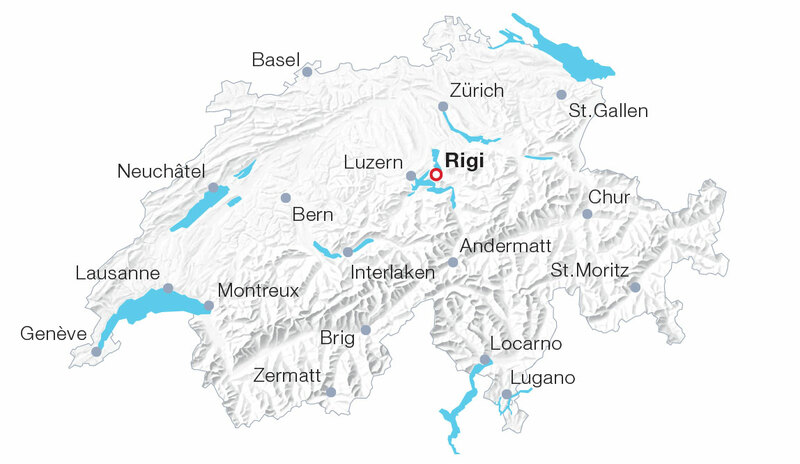 Rigi Railways operates year-round. Consult the timetable.